The cliché foretells of a man, an unassuming man, and a single dog. He will be devastated if there’s not a programme, and may well carry with him a flask. Of course, this is almost never the actual case. Well, not in the sense that our tea-drinkin’, programme-collectin’, probably flat-capped gentleman will be there alone. Even today, a game between two teams that play at level 12 of English football (and Saturday senior football's rungs don’t get too much closer to the ground after that) can attract, not one man, but twenty-five. And no sign of a Jack Russell either. Although there is a small boy hovering around the away bench, clad fully in a red Liverpool strip. Once upon a time, South appeared to be almost a handily placed feeder club for those Reds to the north, with the great Jimmy Case and John Aldridge passing through their ranks on their eventual way to Anfield. 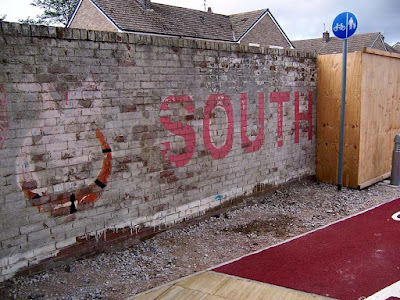 Mind you, South Liverpool were a very different club in those days. In all there have been three incarnations, the original outfit that played in the Lancashire Combination between the wars before morphing into New Brighton; a second which ran from 1935 to 1991, competing in the Northern Premier League from its inception in 1968 until financial problems forced them to fold; and then this third incarnation that initially merged with Cheshire Lines, de-merging two years later. 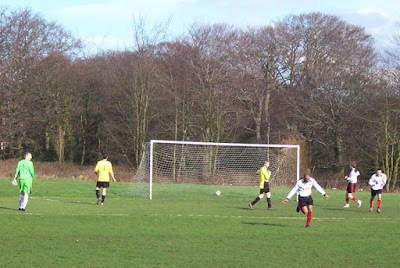 South Liverpool have played in the Liverpool County Combination (now County FA Premier League after the Combination merged with the I Zingari League last year) ever since. During the second incarnation, South played at Holly Park, Allerton (see picture above), which lay dormant for many years after the 1991 collapse. However, in 2006, the site was cleared and its place taken by the new Liverpool South Parkway airport link rail station. Traces of the terrace wall briefly remained, but since the photos below were taken, it has been removed. While they never seriously challenged at the top of the Northern Premier League, they nonetheless applied, more in hope than expectation I guess, for election to the Football League on ten occasions. Still, 1939 Welsh Cup winners; eight runs to the rounds proper of the FA Cup (twice to the second stage); plus flirtation with the football league certainly suggests a club with a proud history, and the latest committee are keen to keep that alive. Today’s matchday programme reprints from a 1914 edition produced for a game against Tranmere Rovers. It appears commercialism was rife in football even then, the top of the team-sheet emblazoned with a good luck message. “W. G. Wicks, the South Liverpool hosier, wishes “the Babes” every good fortune for 1914-15.” Certainly, a footballer can play their game with a great deal more freedom; a great deal more passion and vigour even, when they’re safe in the knowledge that, when push comes to shove, they won’t be found wanting for tights. Considering the free entry, the concrete prison of a changing block, the lack of neutral linesmen and the fact that the opposition are wearing four-year old Manchester City away shirts, you might be forgiven for thinking that we’ve dipped into the murky, beery world of parks football here. There is though a difference and, quite simply, it’s the history. Certainly, there appears to remain a loyalty, however small, to the South Liverpool brand that must be the envy of other sides in their league. The old boys dotted around the sidelines look as thought they may well have once stood on the steps at Holly Park, and at least one, who scampers with a charming eagerness when the ball flies off the pitch around where he is standing, that may just remember the Dingle Park days of the original team. There is certainly a charming archaism about the place. For example, a large amount of today's programme has been produced on a typewriter. However time cannot stand still in all things and now, with Holly Park consumed by car-parking and bus-stops, the South support must be content with watching not from a terrace, but from behind a length of rope, this, like I’ve inferred, essentially being a recreation ground. If so, it speaks volumes for their loyalty, although clearly that was often split. One chap says of his previous evening; “Tranmere on the Friday, the South today...just like the old days”. Furthermore the fact that this two-thirty kick-off means an overlap with the final moments of Liverpool’s game with Manchester United means attention is divided, even on the benches. Indeed, it is only about 30 seconds after South open the scoring, James Kelly side-footing calmly in after beating the eager charge of the Stoneycroft keeper, that their bench are informed “United have just scored.” “Who? United? Ahhhh!” spits the gaffer, exhibiting all the focus of a bus-tyre-crushed disposable camera. 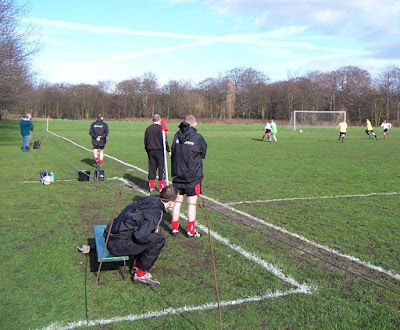 A further South supporter breaks away from his car radio long enough to chat with the one sub who isn’t part of the coaching team and remains sat on the bench, making the most of his proximity to the barrier rope to apply a little motivational asphyxia. On the field, South are dominating, and making the most of the Stoneycroft keeper’s apparent allergy to his own goal-line. However, just as you start to think he’s the most hyperactive and unreliable keeper you’ve ever seen, he pulls off a terrific one-handed save. However he ruins the moment by then attempting to leap, cat-like, upon the ball, only to land five feet in front of it. On 17 minutes, South double their lead, one of the bigger Stoneycroft players goes down heavy, but the ref ignores him, as the lively David Foy exploits the keeper’s eagerness, rounding him and slotting home. Within a minute though, Stoneycroft have a decent penalty shout turned down, the keeper appearing to pull at the leg of the number 8. Five minutes later they finally get their goal, the 9 breaking through the defence and firing beneath keeper Peter Webster. Indeed the ball through the defence, whether on land or in the air, is causing consternation in both defences, the major thing separating the sides being the head-and-shoulders-above quality of South’s two scorers thus far, not to mention the better grasp of passing and rapid movement. Along with the history I spoke of, this clearly raises it some distance above pub level. In Kelly, they have a tough box-to-box striker, and in Foy, a pacey, creative, stick of dynamite. Two minutes before half-time, it is the latter who adds South’s third with a beautifully weighted, first-touch lob over the once-again illogically advanced keeper. That’s not the lot for the half tough, as a fourth is added, Foy completing a hat-trick. A shot past the keeper from their number ten accurately pin-points the forehead of the a defender who has made it back to the line, but as it rebounds, the ball comes to Foy and after checking several times for the right angles send a shot which pinball’s off about four legs, a shin and a big silver bell, and into the net. At half-time, Stoneycroft eschew the Gulag-like charms of the changing rooms for the comfort of the sidelines, while in the centre-circle, the ref plays keepies all by himself, in his head probably thinking “Yeah, that’s right, I’m better than all of these boozers. If only I had some assistants here to see this” With a mountain to climb, Stoneycroft burst out of the traps in the second half, pulling another goal back after two minutes, a cross being met by their 8 in front of desperate tackles by a defender and the keeper, the ball trickling into the far corner. After this, the game’s pace becomes a little less frenetic, particularly as South lose two players two foot injuries, one apparently a broken toe, in quick succession. However, they finish off the scoring, thanks to some not altogether untypically calamitous stuff in the Stoneycroft defence. A ball is passed back to the keeper who clears, but only as far as a South midfielder, who make use of the keeper’s now semi-legendary positioning, to fire straight back into the net. Five points clear in their league, and now in the semi-finals of their divisional cup, it’s shaping up to be a great season for South. If some of these 25 chaps here today have stuck by their side since prior to 1991 then, well, who would begrudge them a double? *Holly Park picture taken from Groundtastic #47, December 2006. I remember seeing South play at Gateshead Stadium in their old Northern Premier League days,didnt know of their reincarnation,even though their life is now in the depths of the pyramid.